Update: (October 4th, 4:30pm PST) Download.com is no longer doing this (at least, not with Paint.NET). I just noticed that download.com updated their listing of Paint.NET to version 3.5.9. Neat. Except that now they’re wrapping it in their download manager which tries to get you to install the “StartNow” toolbar. What a bunch of **** (insert your favorite 4-letter word). I’ve already sent them an e-mail telling them that this is a violation of the Paint.NET license and to either cease this, or to remove Paint.NET from their site. In the meantime, I obviously recommend not downloading Paint.NET from download.com. Update: (October 4th, 9:30am PST) I received a reply from them at 2am stating they had removed the download manager from their listing of Paint.NET v3.5.9. However, as of 9am, they have not actually done this. If you go to the Paint.NET v3.5.9 listing on download.com, it still has their spammy download manager attached to it! Rick, I applaud your stance on this. I no longer download anything from download.com because of this practice. Interesting. I have frequent download.com before, which is how I discovered Paint.NET as a free alternative to PS, and never knew that they try to force feed Bing to users. That is my problem I have with the new IE9, the browser keep insisting to try to install Bing toolbar, which I keep telling it “No, No, and NO!” Or was that for ask.com toolbar? Anyway, as Ron said, I agree with your stance. Also, I downloaded the newer PDN version and so far, haven’t had any problem. Keep it up, man! IE9 does not ask to install the Bing toolbar — or any toolbar. If you keep being asked, then you may need to scan your computer for malware. We’re all behind ya, Rick! Keep up the great work. This is kind of unfortunate as they’re listing is/was quite huge and this appears to be quite recent “addition”. What’s the “small funny thing” … ? Not anymore. And no longer sure if original thought is correct. Minor correction – it’s not actually the Bing toolbar, its the StartNow toolbar. It does use Bing as its engine, but the real Bing toolbar is far more benign (and actually has some useful features, unlike StartNow). Yeah I got the two mixed up. I’ve updated the post. Thanks. They’ve done the same thing with my products but removed the wrapper after my request. Many other developers report the same. Sad that the largest download site that used to be good and had reputation is now involved in such crappy behavior. 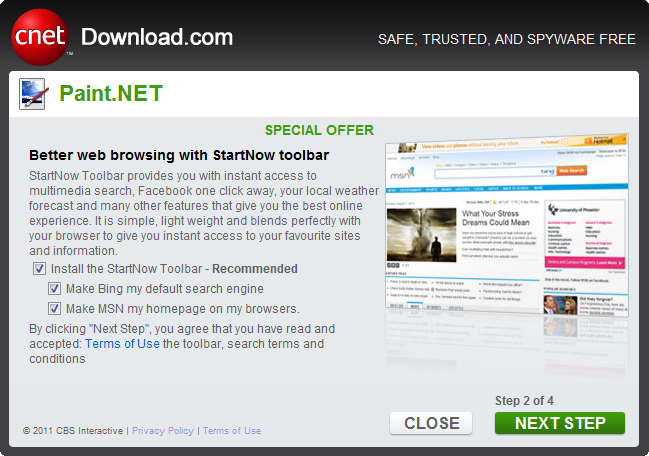 They didn’t even make their crapware installs opt-in, but opt-out! Which means that they completely stopped caring what people think of them. I use http://www.filehippo.com, and there are not problems like these. Rick, my name is marko from freewarebb.com – like many download sites we’ve felt the pinch and I personally have been paying hosting costs since last year after our advertising revenue dropped dramatically. This is the reason why these download sites are beginning to introduce these “installers” – tucows are doing it as well now, they too are feeling the pinch. However, I would rather shut down the site than integrate any kind of installer or try to trick users – we even blacklist software when we don’t like what developers are doing with their own installers. As a responsible developer, stick to responsible download sites – even if they remove the installer from your application, for me, it’s once bitten twice shy – they’ve shown their hand as far as I’m concerned! They (Cnet download.com) now offer the installer as a zip WITHOUT the wrapper exe. I tend to use major geeks for downloads. Yup. Hence the “Update” at the top of the post. It is becoming more and more difficult to publish free software. I tip my hat to you for making a stand against what CNET’s download.com does. Thank you for linking to the “extremetech” article. Having said that.. I understand that money and not charity is the motivation to such services. I wish I could be a paying patron of your brain child. PAINT.NET does deserve to be paid for software. All I am left with is to say thanks for sharing your passion with us. May your fingers keep on doing the walking on your keyboard. I use your software mainly for designing pictures for industrial operator panels. In the PC world the pixel sizes makes it icons. Funny things happen in PAINT.NET when using 1px and 2px rectangles on a canvas of +/- 64x64px. The option to create your own colour scheme is brilliant and works very well when you only have 4 colours of grey to work with. Hopefully the amount of bad press now going around will force a policy change (and a pink slip for whoever’s idea it was). Iiiinteresting. Thanks for the link. They’re even infecting installers for games, like Microsoft’s Age of Empires II!